Electric patio heaters are available in both portable and mountable styles and are the easiest to set up. Some heaters can plug into a standard 120-volt wall socket, but most require higher voltage so they can produce a greater amount of heat at once. For heaters that require higher voltage, the proper wiring will need to be installed by a licensed professional. Before installing electric heaters, check the minimum clearance requirements in the owner's manual to determine the best location for your heaters. For the safest experience, always maintain these clearances. Electric patio heaters are the most efficient style of patio heater available. They convert up to 98% of their energy into heat using a method of heat transfer, called radiant heat. Radiant heat is transferred directly to a person or object, so no energy is wasted on warming the air. 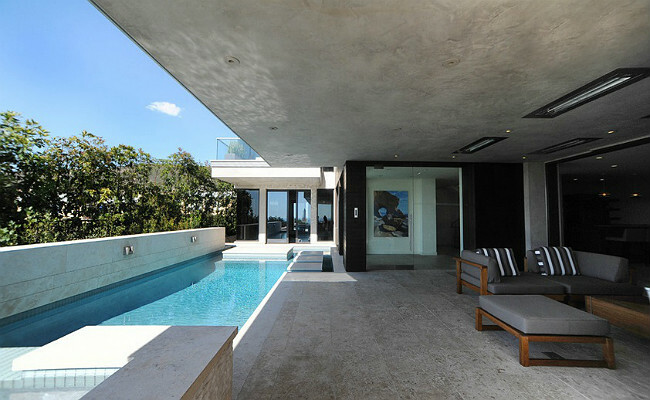 The heat created won’t get carried away by the wind, making it the most effective way to heat your outdoor space. 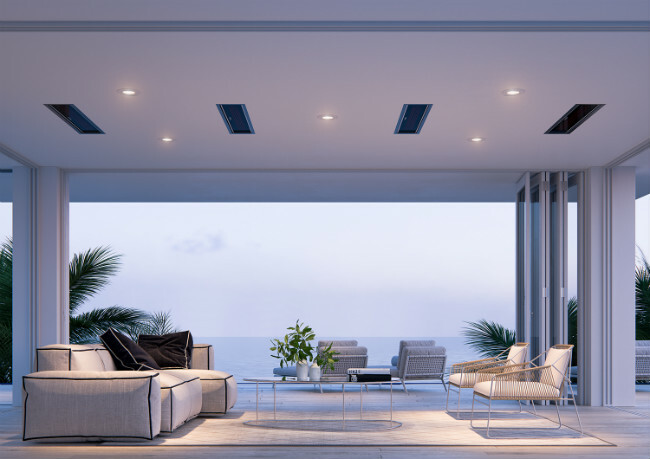 Wall and ceiling mounted electric patio heaters use directional heat to warm a specific area, rather than heating in a circular region, like most free-standing patio heaters. Mounted heaters direct heat outward in a cone shape, so adding multiple electric heaters to your space will ensure you get an even distribution of warmth throughout. Some mountable styles also come with adjustable brackets, so you can move the heat around as needed. A switch is a great, low-cost way to turn your patio heaters on and off. 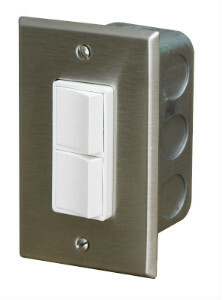 They can be installed in a wall or surface-mounted. For dual element heaters, a stacked switch can be installed which lets you control each heating element independently for half power or full power operation. Variable controls let you control the intensity of the patio heaters. They can come with dimmers, timers, or cycle the heaters on and off at regular intervals to maintain a specified temperature in your space. A remote lets you control the heaters wirelessly. Basic remotes will simply turn the heaters on and off. More complex remotes feature dimmers and/or have several transmission channels that you can program to fit your individual needs. 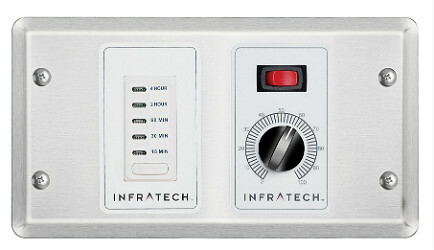 You can control a single heater, or multiple heaters, with the touch of a button. This works well for larger properties and commercial settings. Timers can be installed with other control systems and let you program the amount of time the patio heaters are on. 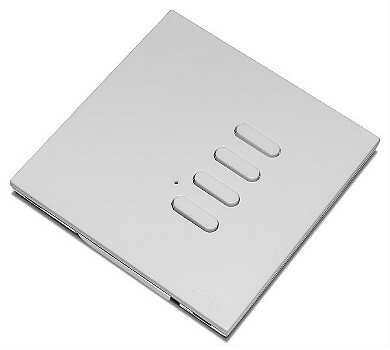 Some heating controls can be connected to a smart home system. This lets you program heating options, save your preferred settings, and gives you the ability to control the heaters off-site with your mobile device. 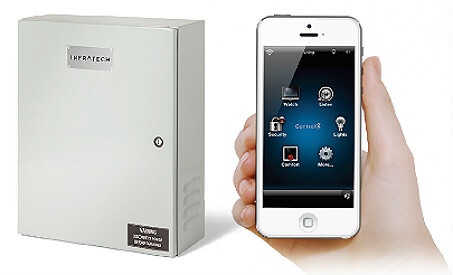 For more information on smart home integration, call our experts at (800) 919-1904. 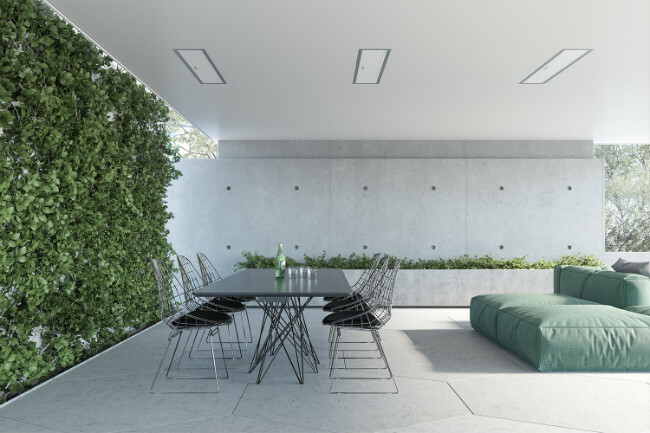 Zone heating is a way to group electric patio heaters together into specific heating zones, giving you the ability to adjust the heat output from one or more heaters in a designated area. 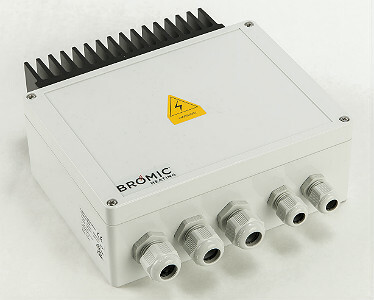 The heaters are hardwired to a specified control box and can be operated with a hand-held remote or wall-mounted control panel. Zone heating works well for larger properties and commercial settings that have multiple patio heaters spread throughout a sizeable area. 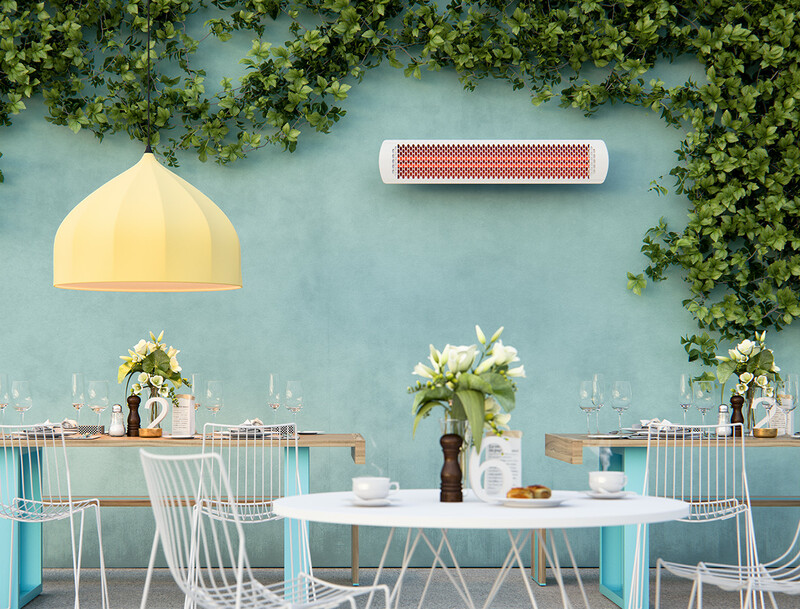 Each Zone can be controlled independently, providing you with an easy way to achieve and maintain the optimal temperature desired, throughout your space. The cost to operate electric patio heaters is between propane and natural gas styles – they cost less than propane, but higher than natural gas. The heating power of an electric heater is measured in watts, rather than BTU’s. The higher the wattage, the more warmth you’ll get. 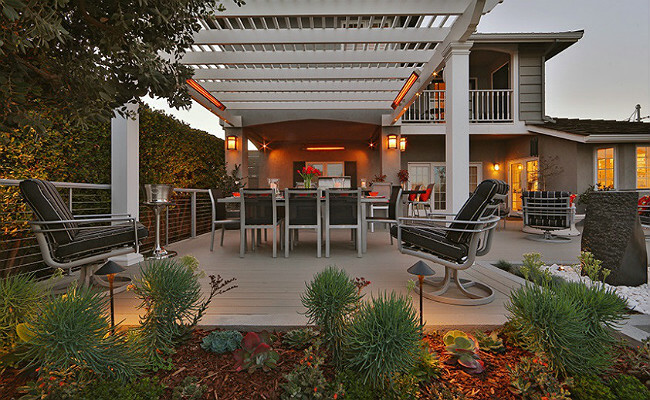 Installing energy efficient patio heaters is a cost-effective way to extend the use of your outdoor room! To determine how much your electric patio heater costs per hour, you’ll need to know the maximum amount of watts your heater consumes and your local rate for a kilowatt hour (kw/hr). The watts will be located on the heater itself, or in the owner’s manual, and you can find your local kilowatt per hour (kw/hr) rate on your monthly utility statement. Take the total watts and divide by 1,000. This will convert watts into kilowatts. Multiply the kilowatts by the kw/hr rate from your utility statement. This will give you the total cost per hour. To get the total daily cost, multiply the total cents per hour by the amount of hours you use it each day. Electric patio heaters don’t require ventilation, so they can be used in both indoor and outdoor spaces. They produce zero carbon emissions and greenhouse gases, making them the most environmentally conscious choice. Even though electric heaters don’t produce actual flames, they still get extremely hot, so always take precaution while operating them. Never leave patio heaters on unattended. Always turn them off when leaving the space, & especially when leaving your home. For the safest options, look for patio heaters that are UL approved and CSA tested. These approvals ensure each heater has undergone rigorous testing to verify that they are a reliable and safe heating appliance. To keep your patio heaters fully functional, inspect all electrical connections annually to make sure there aren’t any damaged wires or cords. Checking the connections regularly will ensure your heaters stay clean and in proper working order. Before cleaning your patio heaters, make sure they are turned off, disconnected from the power source, and completely cool to the touch. Never disassemble the heaters and only clean the outside surfaces. Follow the cleaning guidelines provided in your owner’s manual. The manual will tell you how often to clean the heaters, along with acceptable products and cleaning techniques to use. Is it safe to use a fire pit under a covered patio? Here's what you need to know along with some safe alternatives to heat covered spaces!